JJ, thanks for the information you posted here and the cartoon comparison. Sometimes an important argument can be more effectively presented via pictures. Of course, in terms of overall power over the minds of others, it does not matter whether the controling authority is in the hands of a single man or a small group of men. Well anyway, don’t lose heart, even the GB don’t agree with *themselves* sometimes, as is evident from the way they’ve had to resort to steering the good ship WT by “tacking in the wind”! Recently a friend sent me a movie on DVD of the life of William Tyndale. It is quite amazing how the clergy made the same argument back then as to the validity of their authority as the GB makes today. According to the clergy the pope was the representative of Christ, and the Cardinals and Bishops through the pope. According to JW teachings, the GB is Jesus’ representative and the traveling overseers and elders through the GB. Back in Tyndale’s day reaction to disagreement with church authority was viewed the same way as it is today among JWs, not something to be tolerated. Any disagreement was viewed as wicked heresy. Today it is viewed as wicked apostasy. Extreme forms of punishment were meted out to those “heretics”. Today the most extreme form of punishment allowable by law is given to today’s “apostates”, total banishment. I totally agree with you Andrew. Foxes Book Of Martyres, shows many more who were treated similarly to Tyndale. It’s interesting to note that both Catholic & Protestant sectors used extreme punishments, torure & death on thousands who believed differently to themselves. As I understand from history, this is why the Pilgrims left England & went to America, seeking religious freedom. 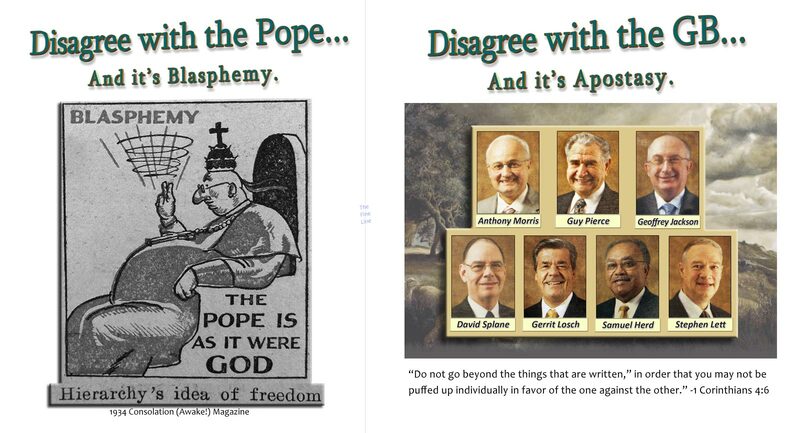 This is one reason that I see the WTS in the same light as the Papacy. I agree with amos – the patterns by set these imperfect men wanting to be rulers over their brothers is very much alike. Unclean teachings – Unclean teachings – Unclean teachings that are the same thing as uncanny power and teraphims. seems like a good time to separate from these things so that Jehovah can take us in as true sons and daughters.